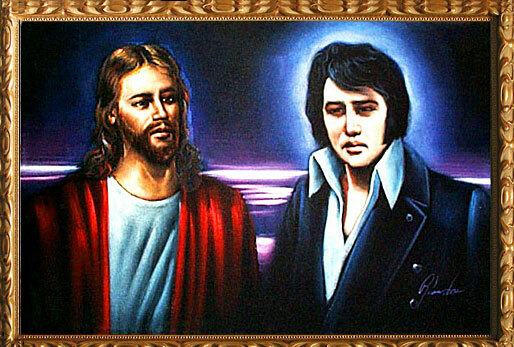 Almost anything painted on velvet attains instant Kitsch status but when it’s the two most iconic figures of all time together on the same velvet stage, well, that’s the koolest kind o’ Kitsch kick possible. I don’t know who would open for who but it’s one koncert I’d kill to kome to, me who rarely sees live music though I guess in this case the live thing wouldn’t be a problem. This is velvet painting royalty no matter how you kut the kake. I hate people who make everything kute by using the first letter of the word they’re spotlighting the same in every word, in this case Kitsch. 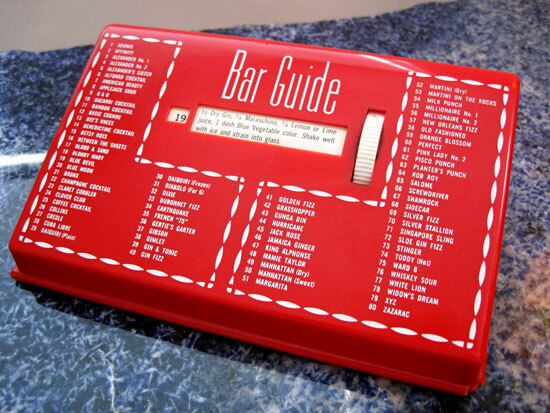 Sorry, I can’t kurb my kumpulsion to komply in the kompany of such Kings..
Just in time for the weekend comes this 1950′s plastic drink guide, the must-have bar accessory in any respectable Space Age home. Spin the dial and get recipes to Atomic cocktails like Between The Sheets, Blood & Sand, Gertie’s Garter, Millionaire Numbers 1 & 2 and Widow’s Dream. No tiki bar, rec room or man in gray flannel suit was without one of these back in the day. 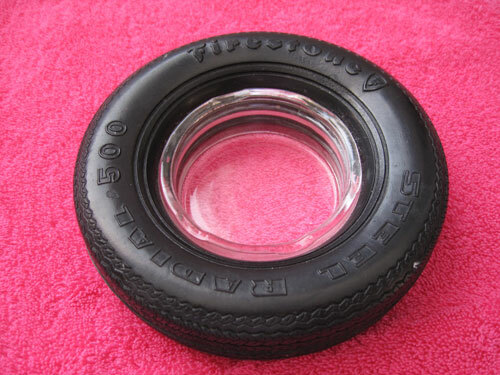 Made of real Firestone tire rubber, these ashtrays hit their peak in the 1950′s but have remained a Kitsch accessory staple through the decades. Growing up in Detroit, they were as common in the city as potholes, given out as promotional gifts from every business that had even the remotest connection to cars or anything else mounted on tires. Sammy’s the Kitsch King no matter how you slice the cheese wheel. His shtick is the barometer against which all other nightclub cheese is measured – though the Candy Man’s case is made all the more compelling because of his Kool factor. 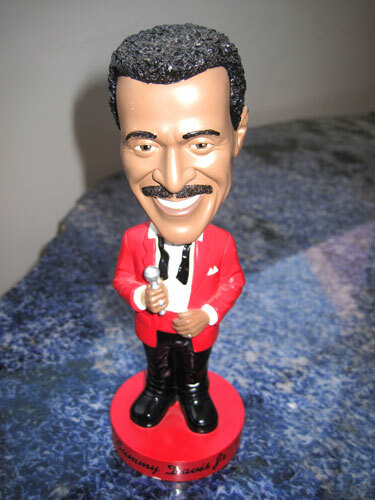 This bobble head is newish but is a limited edition with no new ones being made. My favorite thing about him is that he sits on top of a speaker in my recording studio and bobs his head in loving rhythm to whatever I write. 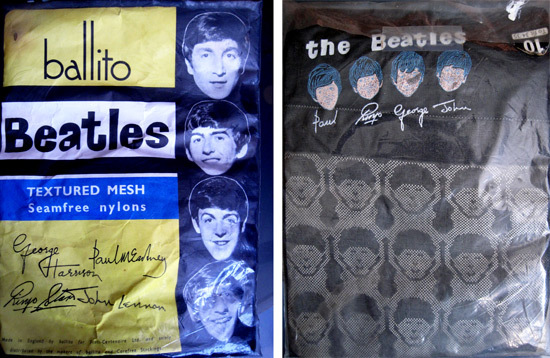 Yea, you got the Beatles lunchbox, the Beatles tray and Beatles dolls but do you have the hosiery? The lads and their guitars are textured into the mesh from thigh to toe as if to say “I Wanna Hold Your Leg”. I posted this one once before but it’s about hot dogs, it’s Memorial Day and this the best instructional weener video I’ve ever seen. Everything about it – the hand modeling of hot dogs, the abrupt editing, the dialog delivery, plates going out of frame, the product itself, not to mention the use of the American flags – all conspire to make this a klassic Kitsch theatrical event. Don’t miss the dreamy musical montage at the end… and have a glorious dog-filled Memorial Day! 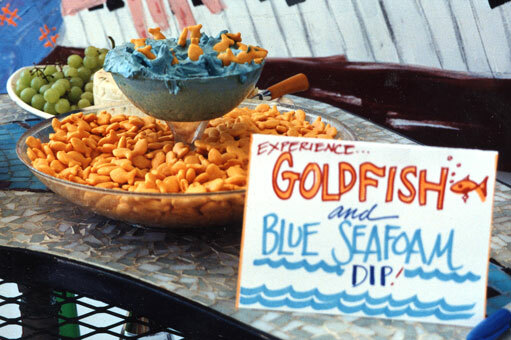 The perfect Memorial Day weekend snack – Goldfish diving into an ocean of blue food colored onion dip. Even your vegetarian guests will be happy! Allee Willis’ Kitsch O’ The Day – Happy Friday Foster! 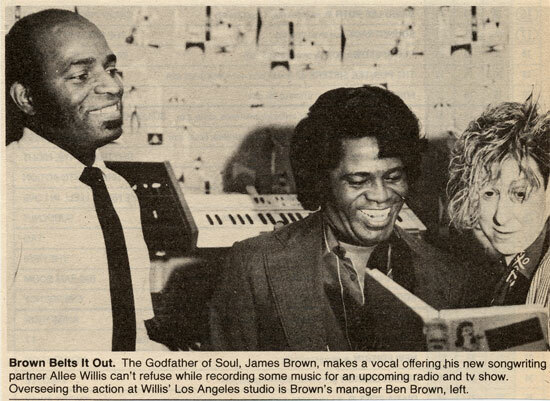 If only for the polyester bellbottomed poolside fashion shows and the razor blades embedded in Pam Grier’s afro, Friday Foster has attained classic blax- and kitschploitation status. 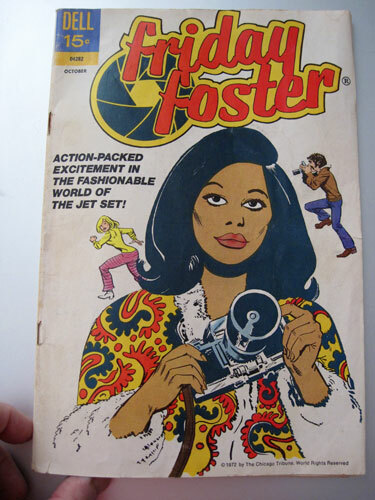 This 1972 Dell comic book version, billed as “Action-packed excitment in the fashionable world of the Jet Set” features assistant photographer Foster gone Shaft in the aptly named timepiece, “The Beautiful People”. Almost didn’t buy this because a) it wasn’t vintage and b) it was SO good I thought it would germinate like weeds in shopping malls throughout the country. But that never happened so I still get lots of oohs and ahhs when I sport this piece of practical Kitsch-meets-great-design. 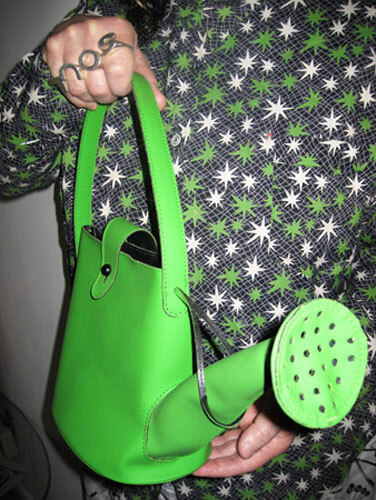 I have these cans I mean bags in neon green, electric blue and shocking pink as you can never have too many and you never know when you or anything else around you might need watering. The spout is especially practical for pen storage.